Summary: In Chicago, we are thrown into a seeming three-way fight between Hawkman, a horrific alien named Lissik, and a young man in street clothes who calls himself Mongrel. Hawkman suggests that he and the young man team up against the alien, but Mongrel hears nothing of it and sends Hawkman reeling with an energy blast from his hand. Flashback to Cambodia, 1970, where an Africa-American sergeant in the US Army calls in an air strike on his platoon's own position, knowing it is suicide, but having no other choice. The sergeant is amazed when he wakes up in a small village, missing part of his right leg, but being nursed back to health by a young Cambodian woman. Eventually, the two marry and have a son, and by 1976, he leaves his son with the Army to be brought back to the states. Back in the present, Hawkman is on his way back to the fight when he runs into Chicago PD Officer Andrea Lencioni, although he doesn't recognize her, despite her insistence that they had several adventures together. Hawkman blows her off and wings back to action. Flashback to a Chicago high school, last year, where we see young Josh Xan (named after both of his parents) being a social outcast and a general bad seed, not accepted by either the Blacks nor the Asians for his mixed heritage. He is suspended for a fight, but catches the eye of a girl named Nhu, whom he makes a date with. Going back to his uncle's apartment, Josh is beaten savagely with a belt for the suspension. That night, he slips out and meets Nhu, and the two of them head to the Netherworld, where they are denied entrance because they are a "Norman and Norma," and don't fit in. As Josh bares his soul to Nhu on a rooftop, they bear witness to a sudden battle -- Hawkman and Hawkwoman fighting Count Viper, and a giant ensuing explosion. In the present once more, Hawkman rejoins the battle against Lissik, but Mongrel is still not interested in teaming up. The young man doesn't seem to care about much except killing the alien, causing plenty of damage in the process. Lissik eventually flees underground to the subway, and Mongrel and Hawkman give chase. Flashback to earlier that day, as a brooding Josh stalks around Netherworld once more, Nhu having finally had enough of his anti-social behavior and going to the school dance instead. Josh is suddenly encountered with a beautiful redheaded woman, who quickly uses her wiles to get him in a compromising position... wherein she attempts to drink his spinal fluid. The attack awakens Josh's metagene, and using is newfound energy powers, he chases the alien away. Confused, he heads for the school, begging Nhu for help. But when he is accosted by an old rival, he cuts loose, declaring himself to be be 'Mongrel,' and releasing a huge amount of energy, leaving the school a smoking wreck. He then heads to his uncle's apartment, and pays him back for all of the abuse; Mongrel says that he always knew one day he would kill his uncle, and that day is today. Before he can finish the deed, Mongrel catches wind of Lissik fighting Hawkman from a news report, and heads out to encounter her. Review: Well, as Mongrel shows up in the next issue in the stack for Hawkman Volume 3, now was the time to go back and read the Annual, which actually came out right after issue #2, according to Mike's Amazing World of Comics. This timing explains the continued mystery of Hawkman's identity, which by that point was not revealed yet in the main book. In fact, Hawkman asks Officer Leoncini "Why do you call me Katar?" at one point. Anyway, getting to the story itself. This is not really a Hawkman story, this serves as an introduction for the New Blood character Mongrel. Whooooooa boy. 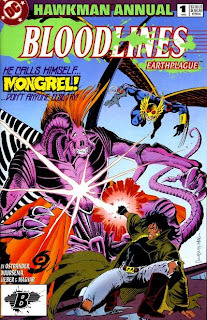 In an event (Bloodlines) primarily remembered for introducing some really lousy characters, Mongrel got to be the lousiest. I can't imagine a less compelling character than this blowhard. His personality is beyond hamfisted, his look is terrible, and his powers incredibly vague. Understood that this was the 90s and anti-heroes were all the rage, but this is beyond ridiculous. His main motivation is his boiling rage which stems from his mixed heritage and the lack of acceptance thereof. For a villain, this would be passable, but for a hero it is merely laughable. Furthermore, his actions go beyond the pale. When he gets to the school dance, he is mocked by Nhu's date, then threatened by the princiapl, and then attacked by his rival, who somehow brought a gun into the building. What is his response? To go all Carrie White on everyone and destroy the school with everyone inside! Ticket takers outside gasp at the carnage and wonder "Did everyone get out?" as Mongrel exits the wreckage. Leveling a school filled with innocent students -- what a hero! Yeah, people do begin to flee, but we don't see that many people fleeing, and there's barely a crowd outside. Did Mongrel bring the building down on top of all the other students and faculty? When he flies off to murder his uncle in revenge, at that point it's irrelevant because he just committed an act of attempted mass murder. This is the character we are supposed to be root for? Give me a break, guys! The writing is credited to John Ostrander, and the mechanics of the story are fine. The flashbacks are easy to follow and the actual action is quite nice. And the bits which feature Hawkman (including a short scene of him talking with some Netherworlders) are on par with the regular series. Unfortunately, the character of Mongrel is so off-putting and egregiously bad that any scene he is the star of just bogs down. There's also an odd amount of references to Hawkworld with no explanation or even editorial notes; seems odd for an Annual which is part of a big crossover, where (assuming) non-regular readers would be picking it up. Although, this does set up a very cool cameo from Shayera, which is always welcome. Jan Duursema's art does shine in places. Her Hawkman still looks excellent and I liked her work on the alien Lissik, both in alien and humanoid forms. But unfortunately, Mongrel simply doesn't work. His look -- torn jeans, mullet, fingerless gloves, trench coat -- was cliched in 1993, and it has not aged well at all. He is a ridiculous character who also looks the part. As I was writing my notes, I asked myself, "Is this a story I would have liked when I was 13, when it was released?" I suspect that at that age, I probably would have bought into the concept of Mongrel as a character. (The costume I still would not have liked.) I am not proud to say that and can only blame the fact that I was 13. Then again, at the time this issue was released I was very down on Bloodlines to begin with, despite having never read any of the series. See, I was working at my local comic shop/video store at the time, and I remember a conversation I had with another employee. He held up a copy of Legion of Super-Heroes Annual #4, featuring Jamm. And he said "Look at this crap. 'Jamm?' I don't even want to read this." And so in my mind, all of Bloodlines was awful from that moment on. Due respect to the creators, but this book did not change my opinion on the story. And to add insult to injury, the story continues over into the Deathstroke Annual. I liked reading a nice long Annual, something which I typically enjoy. But man, this was just not all that good when you get down to it. Hopefully Mongrel will be more palatable in the regular series, but I am not holding my breath. Note: I am going to be revising my Generation tags once more. Mainly, this will impact the "Modern" items, which will now be changed to "Post-Crisis" as we see in this post. This is to reflect the Post-Crisis/New 52 schism and hopefully keep the various Hawkmen straight for those reading the blog. At some point I will revisit my old Generations post and post an update. Image: Hawkman Annual #1, 1993, Jan Duursema. Newsarama has an new article up this morning establishing a supposed "Who's Who" in the forthcoming Justice League of America title. Unfortunately (and sadly typical for Newsarama), a good deal of the information is either incorrect or speculatory. Carter Hall is really Katar Hol of the planet Thanagar, although he somehow lost memory of that before his relaunch in the New 52 as an archaeologist. While this may very well be the final origin of our current Hawkman, until #0 comes out and says that it is so, this is either speculation based on what Vaneta Rogers wants to happen, or simply incorrect. Whether it is the former or the latter is left to the reader to decide. More annoying to me is the entire entry for Katana, which is riddled with errors. Hint: Katana was never a member of nor associated with the JSA. Hint: Katana's sword has always held the soul of her husband. Hint: Katana became a hero by fighting the Yakuza after they killed her family in the Pre-Flashpoint DCU, not just the New 52. Hint: Katana was a founding member of the Outsiders, not just a recent member. "[I]n a new way," huh? I wonder if my speculation (see, it is alright to speculate so long as you label it as such) that Hawkman and GA will start out seeing eye to eye only to eventually to drift apart ideologically was close to the mark. As I have said before, Johns' take on Hawkman and Green Arrow was always a hostile one, while other writers took softer approaches. I am eager to see how it plays out in any case. 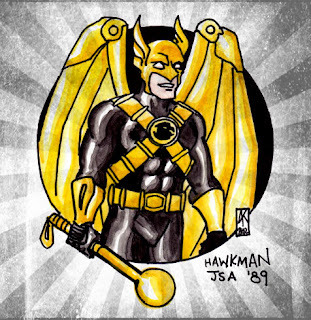 My buddy and fellow Google-Plus'er Andrew Kapellusch drew this awesome Hawkworld/Batman 1989 inspired Hawkman for me as part of a contest on G+. How cool is that?! The combination of the black with the golden trim (including the metallic wings) really gives me a Volume 3 vibe, which as that was the first Hawkman costume I was ever drawn to, so I am on board with that. I like the simple wings, which still have a good design. And you have to love the Honor Wings! Go check out Andrew's G+ page that I linked to above and see the other work he has posted... some good stuff there, which makes me very jealous because my art skills are... suspect at best. Image: Hawkman sketch, 2012, Andrew Kapellusch. Found myself a reader copy of The Savage Hawkman #12, as I have to wait until next week for my box from DCBS to ship. So expect a full review then, but for now here are some quick thoughts on the final issue before Zero Month. After another well staged fight, this time against Pike, Hawkman finds his horizons start to open up, as things get real heavy real fast for our hero. And this is only the beginning, it seems! We get a nice mix of action, exposition (it has to go somewhere), and teasing in this issue. As a lead-in to Zero Month, which is supposed to tell of Hawkman's origins, I can't think of a better way to end things here. We're about to get a lot of information before we set out on a new adventure, and the tease at the end here really whets my appetite to find out what the story is. Of course, now we have to speculate about what story we will actually get -- and who the credited writer is going to be -- but never mind that; for now, let's just enjoy some straight up superhero comics. Summary: Carter and Emma arrive in Rome and meet up with a priest who is the Catholic Church's leading scholar and expert on all things angelic. Carter presents the priest with alien documents which detail extraterrestrial encounters on Earth which potentially undermine the Church's stance on the existence of angels. The priest gets very angry, and suddenly the heavily armored knight St. Bastion crashes through a stained glass window and attacks Carter! Armoring up, Hawkman and St. Bastion clash repeatedly, two battering rams smashing into one another and causing tons of collateral damage. Hawkman has the physical and agility edge, but Bastion's non-stop pursuit and jackhamer like offense keeps the two combatants matched. Emma ends up punching out the priest and accidentally setting the Cathedral on fire. The battle continues to rage between Hawkman and Bastion, axe and gauntlet against sword and shield, until Hawkman is able to anticipate Bastion's lunging attack and knock his opponent unconscious. Hawkman and Emma make their escape, deciding between them that someone set them up, since Bastion was lying in wait for them the entire time. They do not have much time to consider this, though, as Hawkman is shot in the chest by the operative Pike! Review: A slam-bang done in one issue. This is the type of issue which would not be out of place in the 70s, 80s, or 90s, but is something of an abberation in this decade. Carter and Emma show up someplace, trouble starts up, and then it's a superhero battle. I'm sorry folks, but you don't get more distilled superhero story than that. At the end of the day, this story is a success because it executes a complete and classic comic book story in 20 pages and does it without being ironic or ashamed of itself. Liefeld turns in a very straightforward story but one which does what needs to be done and works well. Hawkman's internal monologue is very nicely realized, as he contemplates the nature of fanaticism, and what it means to be fighting a fanatical opponent. This ties strongly with his actual combat actions, and continues Carter's almost academic point of view to the adventures he is having. It's a novel take for a guy who has seen as much as Carter has and is as informed from a culutural standpoint as Carter. The art is amazing. I cannot say this enough about Joe Bennett and the rest of the art team. St. Bastion embodies his fury perfectly, and Hawkman looks fantastic month in and month out. The damage caused by the brawl is excellently rendered as well, with debris flying everywhere as the two combatants tear down the Cathedral. Just beautiful all around. This issue was extremely enjoyable and the cliffhanger was great. Good comic all around. Image: The Savage Hawkman #11, 2012, Rob Liefeld. Justice League Of America... How Does Hawkman Fit? Big changes seem to be in the air for Hawkman over the last week or so, and judging from what we know (and what we do not know) I have a suspicion that they are not done yet. First off, credit to Frank for making the point that the timing of this announcement is in part due to the big dust up last week over Rob Liefeld's rather public departure. Sundays are not usually the day you announce something so this only makes sense. Now then: Justice League of America. In short, I'm excited for this book. To elaborate, I think this is a combination of a creative team who should work very well together with a cast and mission statement which should gel nicely. So that fills me with optimism about this entire endeavor. I just recently commented to the excellent podcast Hey Kids, Comics! (which you should listen to) about how Geoff Johns' turn on Avengers and his current spin on Justice League didn't really make much of an impact for me. I speculated that part of my feelings for these titles is that Johns is better suited to a team of non A-List characters, that he is better able to juggle an ensemble cast where he is more "in control" of the team rather dealing with characters with solo books. My example of this was his very long run on JSA/Justice Society of America, which I ended up reading the entire stint on and really enjoyed. That's the vibe (no pun intended) I get from this series -- recognizable characters who are not the top shelf crew, albeit a lot of these folks have their own books. (For how long is anyone's guess). David Finch is an artist I admit to not knowing much about. Not sure that I have ever read anything which he has done the work on, but from the images I have seen of his stuff (such as on Batman: The Dark Knight and the promo image for this series) looks good. Heavy and weighty, but seems appropriate for a team recruited by a government agent to take down metahuman threats. I am eager to see more of his take on Hawkman, for sure. I do want to say that I am very happy to see that Joe Bennett's Hawkman look is carried over here, complete with the feather details on the harness straps and the detailing on the gauntlets and weaponry. The cast features a lot of characters which I am either a fan of, or at least appreciate. Hawkman, natch. That kind of goes without saying. On this team he looks like he will be the weapons expert and tactician. Hand to hand will be his specialty, as it always is. Johns wrote a strong Hawkman in both JSA and in Volume 4, so I have no real concerns on that front. Finch makes him look great in the promo piece as I said. So how will Hawkman get on with his teammates? Martian Manhunter is a great character who needs some solid direction and better footing. Putting him as the proxy Superman in charge of a Justice League team does reek somewhat of the 1990's but at the same time I support it wholeheartedly. In Johns' hands I have a vague hope of J'Onn getting put over in a way that he has not been put over at any point in time which I can remember. Johns makes his heroes look good. If J'Onn is going to be leading one of Johns' teams, he will look good, both from a power standpoint and a leadership standpoint. Hawkman and Martian Manhunter's history is odd... how will they work together? This Hawkman seems willing to work with others (as seen in his team up with Static), but how will he do taking orders? Green Arrow is a strong match up with Hawkman. The two are set to meet up for the first time in the New 52 in the supposedly-still-upcoming "Hawkman: Wanted" storyline as it crosses over into Ollie's own book. (Side note: according to Liefeld, one of the straws which broke the camel's back was something which Green Arrow scribe Ann Nocenti changed in the crossover issue... wonder what it was?) This begs the question as to what their relationship will be? I have not been reading Green Arrow so I don't know what kind of personality Ollie is presenting in this new universe, and their relationship has always been complicated as it was. I have a sneaking suspicion that these two may actually be friends... at least to start with. Maybe that's just projection on my part. Of course, Johns (and James Robinson, to be fair) had Ollie and Carter essentially at each other's throats in the early days of Volume 4, including Hawkman backhanding Green Arrow on a splash page, so who knows? Should be fun either way. Katana is dressed in the worst costume of her career, and that's a pretty bold statement... but one which is pretty clearly self evident. The idea of Katana on the Justice League is strange to me; she's an Outsider, after all. I had the same response when Black Lightning joined the League. But as we don't have any Outsiders (have we even seen Metamorpho, Geo-Force, or Halo yet? ), I suppose this team of "non Big 7" works. How this will mesh with her status in the Birds Of Prey... I have no idea and no concern. Honestly, Katana as a BoP doesn't jive with me. I always got the "girlfriends fighting crime" feeling from that property, and that's about as far away from Katana's character as can be, at least in my mind. Another hand to hand specialist, I'd like to see how she and Hawkman relate to one another, as both have issues with anger and violence. Frank made a good point as well about the similarities between this crew and the never-released Tony Bedard Batman And The Outsiders series, although at least from the broad strokes we have learned so far the motivations of the books will be different. Still the connections are undeniable. Baz, the new Green Lantern, is a complete mystery. As he should be, since he has not been introduced yet. But a Justice League should have a Green Lantern on it, and if it can't be Guy Gardner in this case, I'm willing to give the new guy a chance. With Hawkman's newly discovered connections to outer space, I wonder what his opinion of the Green Lantern Corps will be? Johns picking Stargirl for this team is no surprise, but at least it's not an unwelcome choice, I figured with Johns role as the creative control officer of DC that it was only a matter of time before Courtney bowed in the New 52, and I figured it would be a team book. So there you go. I've read a lot of Stargirl (or Star-Spangled Kid, if you go back far enough) in team settings but I never was interested enough to track down her starring title Star and STRIPE. But in a team setting I like the character, and seeing this kid rubbing elbows with some of the more "hard boiled" member of this team should be fun. Plus it's another JSAer to hang out with Hawkman! I'm less enthused about Catwoman. I'm not a fan of the character in any meaningful way; I have long thought that her sustained popularity and solo title chops are due to titillation moreso than anything else. Even the way that Finch draws her costume in the promo piece is little more than a skin show. This is coupled with the stink radiating off of her that says to me "Put a Batman character in there." There's other female characters in the DCU which make substantially more sense to be on a Justice League team rather than Catwoman; these characters are not nearly as recognizable nor as popular as Catwoman, and thus they are not in the book. I mean, Vibe is in the book, why not go with Gypsy? Or Big Barda or Crimson Fox or Doctor Light or Vixen? Sorry, but seeing Catwoman on this roster gave me good reason to roll my eyes. Catwoman has been known to steal ancient artifacts, a fact which I cannot imagine Hawkman will care for. As I mentioned, Vibe is also on the team. Honestly, no problem with this. I think that with Vibe the intention was to make a premiere Hispanic superhero for the DC universe. I don't know that the Detroit League was the proper avenue in which to pull off such a feat. Given, again, Johns penchant for putting over his favorites, I suspect that Vibe will come off as a very strong character in this series, and I would like to see his development. He can be brash, cocky, and headstrong, oozing machismo as appropriate, but I'm banking on Johns making him a real, fleshed out young man as well. And I have to say that from what little glimpse we see that his costume as depicted by Finch is a major improvement. I wonder how the hot tempered kid from Motor City will mesh with the take-no-guff Carter Hall? This brings us to Steve Trevor, Agent of ARGUS. You know, a lot of comics fans (rightly so!) champion the elevation of supporting characters whom have been around forever to more prominent status. The most obvious of these is Lois Lane; I remember a short-lived by rather vocal digital outcry a few years back to give Lois her own strip once again, either as an online exclusive or a backup. (For the record I would still like to see such a strip.) I very rarely hear this sort of outcry for Steve Trevor, mostly because it seems like the Wonder Woman fans don't really like him, and the non Wonder Woman fans consider him a wussy "mansel in distress" character. Making him an espionage agent very clearly in the Nick Fury mold is fine with me. It suits him, he doesn't have a place in the current Wonder Woman book, it does justice to his history without laboring over it, and if he happens to run into the Princess and they make eyes at each other, all the better. That having been said it's readily apparent to this blogger that his presence on this team and his new role are direct references to The Avengers, but as I have always said, if you are going to ape something, might as well ape something really good. I'm sure that we will find out more about this book and this team as we get closer to it's debut. I know that I am not the most hard-edged critic in the world, but I have to say that I am eager to learn more about this crew and to read their adventures. I think that this book can fill a role in the DC lineup which we don't have right now, and I think that this creative team on this set of characters can be something special. Time will tell how close to the mark my thoughts and predictions are, but until then, we can all speculate and consider options. What do you folks think? Are you excited about the new team? Dubious of the book? Happy with the cast, or snorting derisively? Leave a comment and let's talk about it! Looks like the Winged Wonder will be a part of the Justice League after all -- just not the one we're reading about now. DC announced today that there will be a new title in 2013 named Justice League of America, which will feature a lineup of Hawkman, Green Arrow, Katana, Martian Manhunter, the new Green Lantern, Stargirl, Vibe, Catwoman, and apparently Steve Trevor, and will be by the team of Geoff Johns and David Finch. They're underdogs who have everything to prove and something to lose. They're a team of unlikely heroes who will help one another discover they're as A-List as anybody -- yes, even Vibe. Though getting there won't be easy. I am absolutely floored by this turn of events. Not that there will be a third Justice League book (since JLI is ending it was only a matter of time), but this lineup is a bit of a shocker. Although, overall I am happy with it. I don't care for Catwoman, the new GL is a big question mark, and I don't think I have ever read a comic with Vibe in it, but the rest of the crew sounds great. I'm a fan of the Martian Manhunter, Stargirl is a fun character, Green Arrow teamed with Hawkman should be a blast, and we get a founding Outsider in Katana! (Though her new costume is the worst she has ever had, and that is saying something.) And with Johns on the book it sounds like he is going to treat this title like his old JSA/Justice Society of America book, which was a consistent winner month in and month out. H/T to Matt Orr who tipped me off about this! Thanks for keeping me in the loop, Matt! Image: Justice League of America, 2012, David Finch. Are you folks getting tired of reading these? Because I can tell you I am getting tired of writing them. More tweets from Rob Liefeld about his latest stint at DC, including his run on The Savage Hawkman. "There was an editorial shift and everything I'd laid out and was approved was unraveling. I stood my ground in defense of what I thought was a strong, positive vision," Liefeld explained, saying that he quit the book on July 4th, feeling that he thought that the editor wanted to write the book for himself. This apparently resulted in the swift movement from someone higher in the DC Comics food chain, as Liefeld went on to explain that "on July 5th I was assured that there would be an editorial change, [the editor in question] had a bad track record and had previous creator conflicts." There's more details and more of Liefeld's... I hesitate to call it ranting, so how about more of Liefeld's thoughts in the article. So the rumors came down yesterday straight from Rob Liefeld about how he was quitting DC Comics after the #0 issues, which in itself ignited a firestorm (not a Firestorm... the fans of that book know who the incoming writer is) on Twitter both with Rob Liefeld and his supporters railing against DC, and fans of the books which he was involved with over the future of their titles. Two of the books -- Grifter and Deathstroke -- have rumored replacements for Liefeld, but there have not been any such rumors about Savage Hawkman at this time, leading to rampant speculation and wringing of hands and gnashing of teeth from Hawkfans. Previously, Liefeld had been somewhat defensive about his role as writer on Savage Hawkman, at one point correcting an interviewer who said that he was only doing plots, with Mark Poulton handling the full scripts. Liefeld said that he was writing plots and scripts, with Poulton only assisting in the writing. But the speculation always was that Liefeld's denial was the proverbial too much protesting, and that he was in fact handling plots while Poulton was doing the scripts. What the truth is we may never know. Going forward the big question is "Who will the new writer be?" and it's corollary, "Will they continue the same storyline?" Liefeld's response when asked on Twitter if "Hawkman: Wanted" will continue was "Not with me," so that is no help. I hope that "Hawkman: Wanted" continues on because I have been enjoying the build up to it and am eager to see the payoff. So who will the writer be? Again Liefeld provides no hints. His tweet in response to that question as "No idea? Geoff Johns? Josh Fialkov? No idea.." So that's pretty worthless as well. Although the rumor is that Geoff Johns is leaving Aquaman next year as well. Would the return of Geoff Johns (or, alternately, someone like Peter Tomasi) bring back in the reincarnation angles as we saw in Volume 4 and Brightest Day? Personally, I think that the story will continue on the current path. I suspect that Mark Poulton will stay on Savage Hawkman in some capacity. I also think that Scott Clark and Poulton may become the writing team for Hawkman as Deathstroke was going to be pulled into "Hawkman: Wanted." After the end of that storyline, I think that we'll get a new creative team (probably writer AND artist, I imagine) and a new direction. Again. Frustration, thy name is me. As much as I have enjoyed Savage Hawkman, it's stuff like this which keeps the character in the middle of the pack, and the book as well. What do you folks think? Who will the next writer be? Will "Hawkman: Wanted" continue on it's path? Will you be keeping up with the title? Leave a comment and let's discuss. Super-Team Family Fantasy Issue: Hawkman & Tor! With the passing of legendary Hawk creator Joe Kubert last week, this "lost issue" of Super-Team Family is all the more appropriate. Combining two of my absolute favorite Kubert characters -- the Winged Wonder himself Hawkman, and the hero of the prehistoric world Tor -- on one cover and then adding a Kubert dinosaur to the mix is as close to perfect as can be achieved in this world as far as I am concerned. This would have gotten my 60 cents easy. What a great story idea and what an amazing cover. Honor Wing Bearer and Chief Match-Head Shag sent me the link to this image, which can be found over at the molto cool blog Super-Team Family... The Lost Issues. Check em out and tell em Luke sent you! Image: "Super-Team Family #170" mock up, 2012, image retrieved from Super-Team Family... The Lost Issues. According to a report on Newsarama, Savage Hawkman scribe Rob Liefeld is quitting DC Comics after next month's Zero Month issues. On Twitter, the writer/artist stressed that it was his choice, saying he "Officially got off the DC52 treadmill this morning," and "I believe in what DC is doing, but had to preserve my sanity." He continued, acknowledging, "This is the 4th time I quit in the last 4 months. This time it will stick." Replacements have been informally announced for Deathstroke and Grifter, but no word on who will take over the writing duties for Hawkman. I suspect that it might be Mark Poulton, who has been Liefeld's co-writer on the series (apparently writing dialogue over Liefeld's plots and/or scripts; it is unclear the actual division of labor). This is something of a surprise and then not something of a surprise. Liefeld has been hinting on Twitter that he was "next" after Grant Morrison to remove himself from DC Comics. So I am not exactly floored by this turn of events. I am, however, surprised that apparently this happened very quickly, because Rob's name is on the solicits for #13 and #14, which are after #0. So this evidently was something unplanned, as DC was advertising his work on the title several months beyond. I need to see who will replace Liefeld before I decide how I feel about this. Honestly, if Poulton takes over and the art team stays in place, and the title continues on the current trajectory, then I don't know that Liefeld will be missed. Then again his plots have been the sort of straight forward, honest superhero stuff which I really enjoy, so who knows? Mostly I am annoyed by the fact that this is our second major creative shake-up in a year. I mean, we just went through this when Daniel and Tan left, now Liefeld is leaving and we are doing it all over again. Like I said, my hope is that Bennett and company will stay in place on the visuals and that we can get someone on board to continue with the same tone we have gotten since #9. But all of that is up in the air at this point -- assuming that Liefeld's quitting even turns out to be true. He has "quit" companies before to no avail; as he said above this is the 4th time he has quit in 4 months. The Savage Hawkman #12 -- It's been a full year since the new Hawkman title started, and what a long strong trip it has been. Fresh off battling the fanatical St. Bastion, Hawkman now has to face the deadly operative known as Pike, who believes it is his destiny to kill the Winged Wonder. Joe Bennett and company have been absolutely knocking the art out of the park, and Rob Liefeld is delivering straightforward and fun superheroics in a high energy manner. I am champing at the bit to read the next installment of this saga as we lead into the big "Hawkman: Wanted" storyline. It drives me a little crazy that I have to wait until next week (or perhaps the week afterwards) when my box from DCBS arrives to get my hands on it! As Honor Wing Bearer Mr P mentioned in the last post, "Hawkman: Wanted" does in fact also spill over into one of Rob Liefeld's other books, Deathstroke, in issue #14. After Deathstroke made a cameo appearance in the first issue of the "Liefeld era" of Savage Hawkman, I figured their paths would cross sooner rather than later. I don't mind saying that I wish it had happened in Hawkman's title so that Joe Bennett would be drawing it and not Rob Liefeld, but I guess those are the breaks. The new solicitations for November are up! Well, most of them, anyway, including the Justice League group, which is the group which conveniently contains the solicits we are looking for here on Being Carter Hall! Let's get right to it, shall we? • The "HAWKMAN: WANTED" epic explodes in this issue! • Continues in this month's GREEN ARROW #14 as Hawkman and Green Arrow meet for the first time in The New 52! • LADYHAWKE, princess of Thanagar, wants Hawkman dead—and she's accused him of the murder of her father and brother! So Princess Shayera finally gets a codename in the from of Ladyhawke! All of this Thanagar talk makes me wonder just what Carter's deal is -- almost seems to me like a Dances With Wolves situation where he is a human who was made "one of the tribe" (so to speak) and became part of Thanagarian society. SO perhaps he is Carter Hall and Katar Hol at the same time. And with the Thanagarians now hunting him, our hero truly is a Wanted man, between the Church, whomever hired Pike, and now these guys! Plus! The first meeting of Hawkman and Green Arrow in the new universe! I can't imagine that is going to go well! 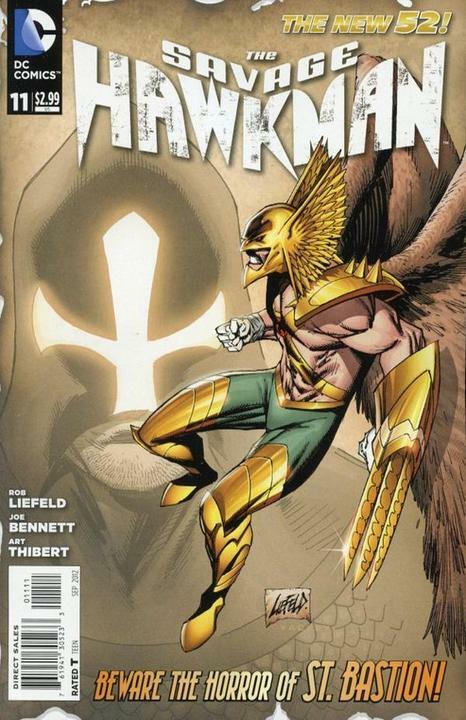 • A "HAWKMAN: WANTED" tie-in issue! • Green Arrow doesn't take kindly to winged threats on his turf and literally jumps into the fight against a team of Thanagarian cops as they chase Hawkman through the skies over Seattle. The timing on this one is a little odd. Savage Hawkman says it is their first meeting, but this issue comes out several weeks earlier... ah well, I get all of my comics in a big box once a month so no big deal for me. Seems the guys I have been calling the Wingmen have a new name as well, the Warhawks. Makes sense, although I find it funny that we have these Warhawks a few months after the reintroduction of the DCAU character Warhawk over in the Batman Beyond strip. Is it too much to hope that the Wingmen will still be the police force on Thanagar and maybe the Warhawks are the soldiery? I suspect that the team-up of Hawkman and That Formerly Goateed Moron will be a lot like their first team up in Volume 4, which is to say: not exactly smooth sailing. • Does super-genius Sloan really know what's best for this world? To answer the second question, I would imagine that it seems likely that they would, but Robinson will probably swerve us and have Green Lantern turn them down or something. After all the book is not titled "Justice Society of America." I was listening to the excellent podcast Hey Kids! Comics! this morning and they were discussing the New 52 Swamp Thing title, including The Green, The Red, and The Rot. So where does The Grey fit in? If The Rot is the legion of the Deadworld, is The Grey the ancient world, perhaps? Grundy has been around (presumably) for a long time buried underground. And is it me or does the idea of Terry Sloane being a bad guy really sound like Ozymandius from Watchmen? You can check out all of the Justice League group covers right here! So what do you folks think about these solicits? Do they get you excited for the upcoming storylines in these titles? Are you looking forward to seeing Hawkman and Green Arrow team up? Or meeting the new Shayera? Or perhaps seeing Earth 2's Hawkgirl in action? Post a comment and start the conversation! While looking through the archive to find the link I used in the previous post, I realized that it has been just over 4 years since I started Being Carter Hall. 4 years! A lot has changed for me over that time -- mostly good -- and a lot has changed for the Winged Wonders as well. Hard to believe that it's been four full years of blogging about Hawkman and Hawkgirl in all of their iterations -- and yet I have still not produced some of the content I have promised! Well, just goes to show you that some things never change. Keep watching the skies and keep watching this space. More Hawk goodness will always be forthcoming as long as Being Carter Hall is here *wheet wheet!*. It's a sad day in this 4 Color World we all like to hang out in, as legendary comics creator Joe Kubert passed away yesterday. He was 85 years old. The first Hawkman story I read on my way to becoming the Hawkfan I am today, as well as starting this blog, was The Brave And The Bold #34 as collected in Showcase Presents: Hawkman Volume 1. I was immediately drawn to Kubert's art for the Winged Wonders, which was both graceful and powerful at the same time -- like a bird of prey in flight. He also made the fantastical alternate forms of the Thanagarian rogue Byth look amazing as well. I knew from there that I was in for a treat. But it's not just Hawkman. The more Hawkman I read, the more I wanted to see other Kubert stuff. Eventually I found his prehistoric epic Tor, which took Kubert's art to its most basic and primal state, just man and the natural world he lives in. It is a lush, beautiful work, filled with drama and excitement and imagination. And I cannot even begin to express my appreciation of his work on Sgt Rock, which to me is the finest example of the War genre in comics and some of the finest stuff ever committed to the 4 Color page. As I was filling out my order form for my comics this month, one item which I checked off was the upcoming Joe Kubert Presents from DC. A big showcase project for Kubert and what he has done for the comics world. Somehow it seems fitting that this project is coming out now, right on the heels of the industry losing one it's greats. Rest in Peace Mr. Kubert. You will be missed but your work and your legacy will live on forever. Thanks to the ever vigilant Raul Cotto (Verified! Follow @MASFUEG0!) we have... this. According to Raul, its a Hawkman Box Hero costume... looks like the beginnings of a Hawkman Lego Minifig come to life to me. Still, one has to admire the dedication and craftsmanship to produce something like this. I imagine this will look very cool once it's painted up. Normally the blocky look would be for a character like Iron Man, but seeing it on Hawkman is still pretty cool, don't you think? Image: Hawkman Box Hero, 2012, image obtained from Facebook. In this issue, Carter and Emma head to Rome to meet with a priest who is the Catholic Church's foremost expert on angels and angelic history. Needless to say, things go south in a hurry, and Hawkman must face down the fanatical St. Bastion! The verdict: BAM! A hard-hitting, fast-paced, slam-bang done in one issue which transported me back to my early days of reading superhero comics in the 1990s. I don't mean that as a dig because I really, really enjoyed this issue. Carter shows up someplace, gets into hot water, and then there is a fight. Does it get any more pure superhero than that? St. Bastion has a great look and the battle between him and Hawkman looks fantastic. Joe Bennett and the rest of the art team absolutely knock this one out of the park. And Rob Liefeld's dialogue is the same straight forward and doggedly earnest style that we have seen in the last few issues. I especially enjoyed Carter's internal monologue during the battle, where he considers not only strategy but also his opponent's state of mind. A more in depth review ill be forthcoming, but I definitely dug this one. Shayera And "Wingmen" by Joe Bennett! 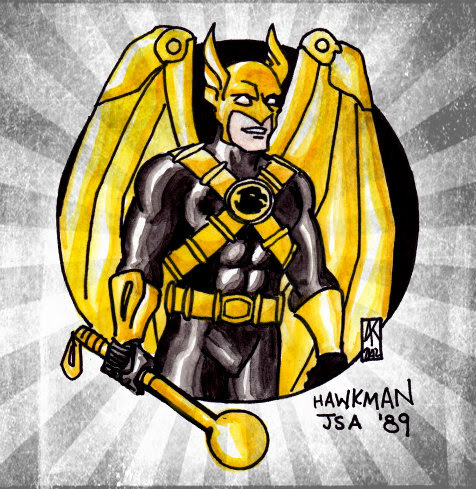 Joe Bennett, artist extraordinaire on The Savage Hawkman, has been very open with posting sketches and pencil pages online as he is working on the title. Today we have one of the nicest ones yet, featuring the yet-to-debut "Princess Shayera" and two bodyguards, whom I am still calling "Wingmen" out of some misguided senses of nostalgia. Our Favorite Female Buttkicker looks ready to do just that, armed with a wicked looking mace and a stare which looks like it could shatter glass. Her helmet looks fantastic, and I can't wait to see her uniform colored. Her two Wingmen attendants look very sharp too. I really like their full face masks, making them look almost like an elite guard or something (appropriate if they are hanging out with Shayera, yes?). They have very nice armor as well and I like that they are totting guns, suggesting that only royalty like the Princess would wield a melee weapon. Man, I cannot wait to see how this story is going to unfold, especially with Bennett drawing it! H/T to loyal reader Matt Orr (follow @HawkmanFans) for the tip! Image: Princess Shayera and "Wingmen" preview, 2012, Joe Bennett.